David Perry Sinnett has been credited by maritime authorities, such as Howard Chappelle in "American Small Craft", with having built the first vessel ever to use the strip plank method of construction. 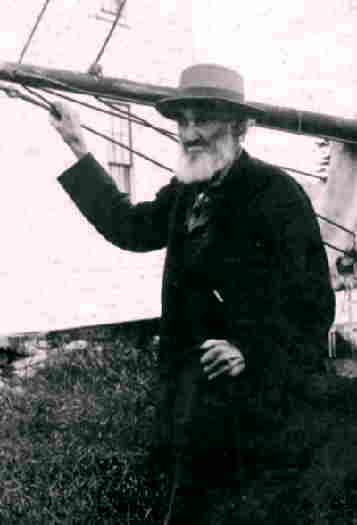 Sinnett was a fisherman, boat builder and resident of Bailey Island when, in 1877, at about the age of 33, he began building a few two masted, lapstrake vessels called Hamptons. The design had originated in Hampton, New Hampshire and these boats were popular with the inshore fishermen of the day. Sinnett decided to square off the stern of this double-ender as an experiment. Shortly after Capt. Sinnett began his square stern experiments. a local fisherman, Thomas Lubee, asked if the Capt. could built a square sterned, smooth hulled Hampton for him. Sinnett worked up a model and began gathering the stock. He built this vessel of wood strips, one and one half inch by one inch, nailed one on the other and put in ten pairs of steam bent timbers. This was the first smooth seamed, strip built Hampton ever constructed. (It has been surmised that he began using strips in boat construction because of a shortage of clear pine planking. The strips could be salvaged from the formerly unusable scrap that was abundant around his shop from cutting planks for previous boats). These sea-worthy vessels ranged from 21 feet to just over 30 feet with the most popular being 21 or 24. About the turn of the century, power was added in the form of a one-lung Hartford or some other style of single cylinder make and break engine and by 1907 it was estimated that there were over 300 of these vessels in Casco Bay waters. Capt. Sinnett guessed that he alone had build 175 of them, and other Bailey Island builders had copied his methods as well. Prices ranged from about $5.00 to $12.00 per foot and Sinnett figured he could build a 20 footer for $100.00.